Is Bruce Nauman psychedelic? Though his early work is generally considered formally and conceptually apolitical, one wonders how much the culture in San Francisco in the mid-1960s—from the Free Speech Movement to the Summer of Love—influenced his mindset at the time. After Nauman graduated from the University of California, Davis, in 1966, he established a studio in a storefront in the Mission District, where he spent several years realizing a now-seminal body of work that drew from the city’s tradition of Funk art as well as Minimalism from New York and Finish Fetish from Los Angeles. Though the artist has only admitted to drinking a lot of coffee in the studio, might have he sweetened his beverage with special sugar cubes? “Nauman had a lot of time on his hands,” wrote Constance M. Lewallen in a recent exhibition catalogue, “and very little money.” Though the artist taught one class at the San Francisco Art Institute, he didn’t fraternize much with his fellow professors and spent many hours in the studio. In his Mission District space Nauman underwent intense self-examination and self-exploration, as the story goes, and made a monumental shift from making objects to foregrounding process. He contrasted the ephemeral nature of physical senses by casting his body parts—arm, ear, mouth, armpit, knees, hands, back, shoulder, and feet—in solid materials. He also explored language, especially the profound nature of jokes and puns, and documented loosely choreographed, seemingly absurd performances on camera. Let’s look at a few of these works. One film depicted Nauman, dressed in a light t-shirt and dark jeans, Walking in an Exaggerated Manner around the Perimeter of a Square (1967–68); for another, Art Make-Up (1967–68), he filmed himself covering his face and torso with white, pink, green, and black paint. 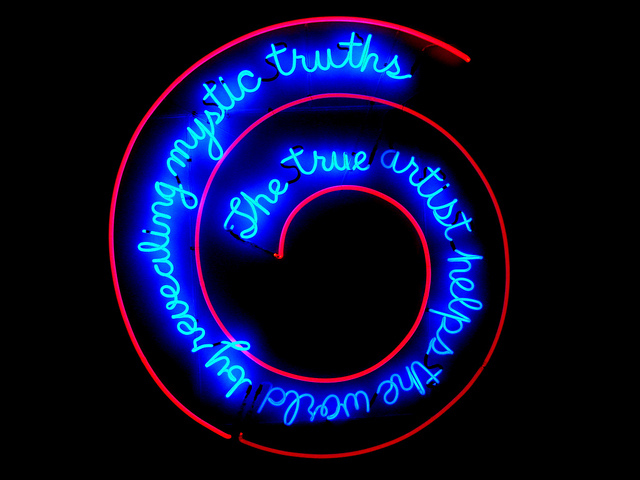 Nauman also hung a neon sign in his studio’s front window—the well-known The True Artist Helps the World by Revealing Mystic Truths (1967)—whose words must have both baffled and delighted passersby, which would have included stoned hippies. Another neon sculpture, My Name as Though It Were Written on the Surface of the Moon (1968), spelled out “bbbbbbrrrrrruuuuuucccccceeeeee” in lowercase cursive script, referencing the lower gravity on the Moon’s surface but also the slower sense of time that a drug user purportedly experiences. 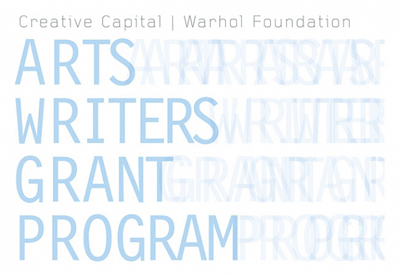 Traditional scholarship on Nauman’s work at this time focuses on his interest in the playwright Samuel Beckett and the philosopher Ludwig Wittgenstein, as well as to contemporaneous avant-garde dance groups (Anna Halprin) and underground film (Kenneth Anger) then flourishing in San Francisco. But what about psychedelia? After all, Nauman’s studio was located only three miles from Haight-Ashbury—the heart of American counterculture—and his work at the time was pretty far out, man. The art critic Ken Johnson offers a theory of psychedelic art in his book Are You Experienced? How Psychedelic Consciousness Transformed Modern Art (New York: Prestel, 2011), which considers work that was previously understood as embracing psychedelic characteristics (Fred Tomaselli, Robert Crumb) to those that didn’t (Sol LeWitt and Adrian Piper, Kay Rosen and Kara Walker). It’s fair to ask how the boxes of Donald Judd might look to a stoned viewer? How might the implausible or impossible works of Conceptual art correspond to the root of the word psychedelic, “mind manifesting”? Johnson makes a compelling argument for seeing twentieth- and twenty-first-century art in a new way. Rethinking the influence and potential of psychedelics is happening across culture, into business and science. The artist Emily Segal, the host for tonight’s event and a cofounder of a trend-forecasting company named after a drug experience, asked: “Is K-HOLE art influenced by psychedelia in a different way?” While recently browsing the shelves of a bookstore, Segal came across a Neuropsychedelia: The Revival of Hallucinogen Research since the Decade of the Brain (Berkeley: University of California Press, 2012). The book, written by the handsome and youthful-looking Nicolas Langlitz, an assistant professor in the Department of Anthropology at the New School, attempts to reconcile mysticism with materialism through a historical, anthropological, and philosophical analysis of his subject. Segal invited Langlitz to give a presentation at the Swiss Institute, in conjunction with its summer exhibition, The St. Petersburg Paradox. During his talk Langlitz surveyed the history of psychedelic research in Switzerland and the United States and explored how mainstream society and the counterculture have found common ground, especially over the last twenty-five years, since President George H. W. Bush declared the 1990s to be the “Decade of the Brain,” which initiated a federal campaign to raise awareness for neurological research. The history goes back further, though, to the mid-twentieth century. Langlitz reminded us that pharmocological breakthroughs such as antidepressants and antipsychotics were discovered, refined, and produced in the same era as LSD. From Albert Hoffman to Timothy Leary to Richard Nixon, Langlitz traced the decline of scientific research up to the 1970s. (Nixon established the Drug Enforcement Agency [DEA] in 1973.) After that time the occasional rogue scientist operated on the fringes, such as the Californian scientist Alexander Shulgin, who created about two hundred varieties of psychedelic substances and tested them on himself with a government-approved license that was revoked in 1994 after self-publishing what were essentially drug cookbooks. Since then knowledge about psychedelic use has permeated the internet, notably through anecdotes on the website Erowid. Today there are two groups advocating psychedelic research. The first is the Multidisciplinary Association for Psychedelic Studies, a group based in Santa Cruz, California, that frames its work to mollify—I mean, appeal to—the establishment by addressing such conditions as posttraumatic stress disorder and end-of-life anxiety for the terminally ill. “Nancy Reagan,” Langlitz joked, “would not say no to a drug that would alleviate anxiety.” The second group is the Heffter Research Institute, an institution based in Zurich, Switzerland, that Langlitz said has a “less activist brouhaha.” Advocates for psychedelic research have come from unusual places, such as the “Silicon Valley gods.” Bob Wallace of Microsoft funded Swiss research in the 1990s, and John Gilmore of Sun Microsystems and the Electronic Frontier Foundation has been a longtime activist. Based on his positive recollections of psychedelic experimentation, Steve Jobs was approached for money—directly from Hoffman, it turns out—but the Apple cofounder declined to get involved. Switzerland has a liberal drug policy that dates to the 1910s, Langlitz stated, perhaps not unrelated to a large chemical and pharmaceutical industry in the famously neutral country. The 1990s saw a loosening of state policy: government-run clinics began supplying heroin to addicts, and scientists were permitted to run a mobile drug-testing lab in a popular Zurich techno club. When people come to find out what their still-illegal purchases are made of, they talk to social workers and take surveys, generating data that helps researchers to determine patterns of drug use and dosage, to monitor black-market products, and to educate club goers about current substances. Scientists also recruit, via the mobile unit, human test subjects for laboratory experiments. The lively Q&A session with the audience revolved around three issues: differences and contradictions between physical and spiritual experiences; the authenticity of mystical experiences, hallucinogenic or otherwise; and the aesthetics of psychedelic art. Indignant with the term “spiritual,” one audience member asked Langlitz to produce an objective term. The psychedelic “experience is material through and through,” he responded, calling attention to the chemical nature of all brain activity. Like many, though, Langlitz is curious about what does the subjective experience opens, especially regarding the shared qualities of oneness, loss of ego, and being neither subject nor object that drugs offer. Aldous Huxley believed that all religions are built around “unitative technologies,” Langlitz said, which were achieved through practices such as fasting, meditation, chanting, and flagellation (ouch!). Theologians may claim that hallucinogenic drugs provide an inauthentic, valueless experience, Langlitz continued, and prefer prayer and meditation. But Huxley had trouble obtaining elevating experiences the old-fashioned way, he continued. We shouldn’t limit the influence of chemicals on behavior to psychedelics. What does an authentic experience mean, Langlitz wanted to know, for a person taking Prozac? Is he or she experiencing real or false happiness? Similarly, he mentioned that anthropological research on psychedelics—especially in the 1970s—has focused too much on the shamanistic (and presumably authentic) use, in contrast to studies of how everyday people might find transcendence. Langlitz finds that large-scale photographs by the German artist Andreas Gursky better represent the psychedelic experience, especially with the simultaneous macro- and microscopic perspectives in his busy images of hotels, stock exchanges, sporting events, raves, and commercial retail stores. As an art student, Gursky was influenced not only by his famous teachers—the straight photographers Hilla and Bernd Becher—but also by his LSD experiences. Today Gursky is too famous or too concerned with his professional image, Langlitz conjectured, to talk openly about psychedelics, like he did early in his career. In Terms Of count: 1 (an audience member broke the seal toward the end of the Q&A). Constance M. Lewallen, “A Rose Has No Teeth,” A Rose Has No Teeth: Bruce Nauman in the 1960s (Berkeley: University of California Press, 2007), 45.